Pediatrician-tested Banana Boat UltraMist Kids Clear Sunscreen SPF 110 provides ultimate broad spectrum protection from the sun. The easy-to-use spray yields a continuous spray of clear, no-rub sunscreen that will protect your child’s sensitive skin from the sun’s UVA and UVB rays. Recommended by the Skin Cancer Foundation, the hypoallergenic sunscreen is water resistant for up to 80 minutes. For fun on the beach, at the playground, or in the water, Banana Boat UltraMist Kids Clear Sunscreen SPF 110 is formulated to protect delicate young skin from 99 percent of the sun’s UVA and UVB rays. With an SPF of 110, the sunscreen provides maximum protection from the sun, so it’s ideal for fair skin. The sunscreen is water resistant for up to 80 minutes so your child can splash in the pool or work up a sweat without reapplication. The gentle, hypoallergenic sunscreen is pediatrician tested and recommended by the Skin Cancer Foundation. UltraMist Kids Clear Sunscreen sprays on easily, allowing you to quickly cover children with the clear sunscreen. Packaged in an easy-grip spray can that holds 6 fluid ounces, the rub-free formula dries quickly. Remember to apply sunscreen 20 to 30 minutes prior to outdoor activity, even on cloudy days. Banana Boat UltraMist Kids Clear Sunscreen SPF 110, 6 fluid ounces. The sun protection factor, or SPF, of sunscreen is a multiplier that tells you how much longer you can stay in the sun than normal without burning your skin. If your child can tolerate 1 minute in the sun without a burn, an SPF of 110 will provide 110 times that length of time, or 110 minutes of protection without burning. Both UVA and UVB rays cause damage to your skin. UVA rays are the main cause of skin aging and wrinkling, while UVB rays cause burning. Both contribute to the development of skin cancer. For the best protection, use a sunscreen with broad spectrum UVA and UVB protection. It’s cloudy outside–why does my child need sunscreen products? UVA rays are present throughout the year and can penetrate glass and clouds. They account for up to 95 percent of UV rays on the Earth’s surface. UVB rays vary by season, location, and time of day and are strongest between 10 a.m. and 4 p.m. in April through October. For maximum protection, reapply every two hours or immediately after swimming, excessive sweating or towel drying. Banana Boat UltraMist Kids Clear Sunscreen SPF 110 is water resistant for up to 80 minutes. Why can’t I use an adult sunscreen on my child? Children have more sensitive skin than adults. 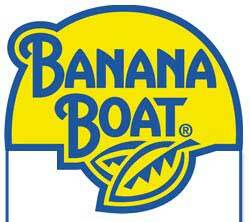 All Banana Boat products for babies and children are pediatrician tested and are gentle on the skin. Are there any other Banana Boat sunscreen products recommended for kids? Yes, Banana Boat Kids SPF 50 Sunscreen Stick is ideal for spot application around the ears, nose, and eyes. There are also tear-free, sting-free sunscreen options. 2. Apply sunscreen on your kids at least 20 to 30 minutes before they race outdoors, whether it’s a cloudy or a sunny day. Banana Boat UltraMist Kids Tear-Free Sting-Free Sunscreen Continuous Lotion Spray is a fast and convenient way to get them covered before they slip away. 3. Make sure to reapply sunscreen frequently, at least every two hours, and more often if children are dipping in and out of the pool, ocean or lake-or running through the sprinkler. 4. Little ones, especially babies, become dehydrated more easily than adults. When outside with the family, always have extra drinking water on hand. 5. Remember that children imitate their parents. If they see you putting on sunscreen, they are more likely to cooperate when it’s their turn. 6. Make sunscreen application a part of the daily routine. That way you’re likely to encounter fewer struggles, and you’ll be teaching your kids a life-long healthy habit. 7. If your child falls asleep during that lunchtime picnic or while out on the beach, apply one or more of the following protection solutions. First, spray them with an easy-to-use sunscreen like Banana Boat UltraMist Kids Tear-Free Sting Free Sunscreen Continuous Lotion Spray. Then, either provide them with some shade, which offers 50% protection from the sun, carry them inside, or cover them up. 8. Sun protection can be easy with Banana Boat Sunscreen Kids Stick SPF 30, which is great for covering those vulnerable spots like ears, nose and under-eye area. 9. Always use products designed specifically for the sensitive skin of babies and kids. The Banana Boat brand babies and kids line are all pediatrician-tested, most are as mild as water, and some are Tear-Free. 10. Teach your children that the sun is to be celebrated and respected all year round! By taking a few simple precautions during every season, they can enjoy a lifetime of magnificent rays.